Windows 7 Expert Training Materials is designed for trainers to create Windows 7 Experts in the workplace. Confidently train employees how to use remote desktop, windows contacts, troubleshoot their computers, use the system configuration utility, system restore and more! Seeing is Believing This sample manual to teach Windows 7 - Expert is in MS Word format. 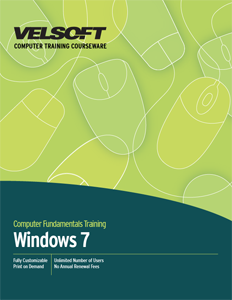 Harness the power of the internet with Microsoft Windows 7 and Trainingmaterials.com's fully customizable courseware. Having the expert level courseware is like having a key to all of what the operating system has to offer. Have problems? No more having technicians come and fix Windows issues as the courseware has a section on troubleshooting your system. Not only does the built in voice recognition software let you dictate documents onto your computer, it allows for system control - just by speaking to your computer! The most unique feature that Windows 7 has to offer is the ability to host a second operating system within itself. Though additional (and free) downloads through Microsoft, you can install Windows XP directly within Windows 7. This is essential for when you have an older program or hardware that isn't compatible with 7, or if you want to have a testing environment without harming your operating system. Learn more about these and many more features when you use Trainingmaterials.com's professionally designed courseware. Download your free sample today.